We got an early peak at several Cowboys this weekend. Here’s how they looked. The OCU open was this past weekend and several Cowboys took part. Let’s take a look at how they fared by division. With an open tournament like this, for our top guys that we know will be pretty solid, it unfortunately doesn’t reveal much. Daton Fix for example, is going to be a superstar, but outside of confirming the weight he’s wrestling at, all we really see is him dominate a bunch of guys we already knew he was better than. We do get an idea of what’s going on in the room and what weights guys will probably be at. This was to be expected, but we now know Piccininni will start the season at 125 and Fix at 133. I think that could possibly change later on, but it does look like that’s how they’ll start it. Huge match for Fix in the first dual as he’ll take on defending NCAA champ Seth Gross at SDSU. Nieman getting second at 133 is definitely a positive. Tough to see where he could impact the lineup, but it was a good finish for him. Kaden Gfeller did what was expected in winning here at 141. It will be interesting to see whether he or Kaid Brock emerge as the starter. Both are very good. I don’t think this finish indicates anything, but I projected Kaden to start at 141 at the end of last year. I still lean that direction at the moment, but it could go either way. Don’t rule out Kaid Brock cutting down to 133 if Kaden does win the job at 141. Jonce Blaylock won at 157. We didn’t see Andrew Shomers, which was unexpected, but it’ll be between those two to decide the starter at 157. Shomers won that matchup last year. Jonce is a gamer though. Don’t rule him out. It was interesting that at 174 is Chandler Rogers weighed in at 168.3. Very likely indication that he will go back down to 165 this season. He dominated. I really wanted to see Joe Smith to figure out what weight he’s going. I’m not sure what the story is on why we didn’t, but Joe did not wrestle this weekend. Probably the million dollar question, which I don’t have an answer to, is where will we see Joe Smith? Dakota Geer is very tough at 184. I have a hard time seeing Joe or Jacobe Smith jumping up and taking away the starting job from him there. And a healthy Weigel at 197 was a positive thing to see. It’s likely that Andrew Marsden starts here next year, so keep an eye on what he continues to do this season as he backs up Weigel. Last week I told you what to watch for at Heavyweight, due to it’s implications for next year. It would’ve been better to see a slightly higher finish for Putnam, but it was interesting that Austin Harris was back down at 197 after wrestling up this summer. My gut tells me that Harris will make the bulk-job over the summer and try to contend for that starting spot that opens up next year when White graduates. Harris and Putnam are two guys you really want to pay attention to throughout the season, even though neither will be starting this year. You really want to see some solid development here because it looks pretty likely that one of them could be relied on at heavyweight next season. One of the other areas I recommended paying attention to in my preview was the freshmen. 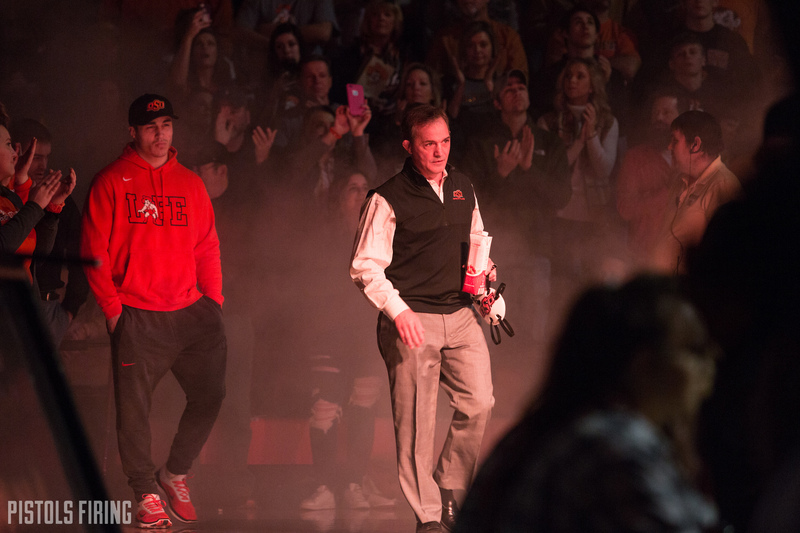 Everyone from OSU that wrestled in the Freshman/Sophomore is a true freshman and all are almost certain to redshirt this season. Conner Wilson had actually put together a pretty good tournament and was into the semifinals at 141 before getting hurt and defaulting out. OSU is incredibly deep at this size right now, so it’s unlikely any of these guys will start in the immediate future, but I’ve heard positive things on Wilson. If he’s coming along well, which it looks like he is, that’s a good thing. In a couple years he could end up impacting the lineup. There were a bunch of guys that came in at 165 this year. Jalin Harper didn’t wrestle here, but the rest of them did. Of that group Colt Denney came out on top, and looked solid doing it. This is another weight where OSU is stacked deep currently. In a few years, depending on how sizes separate out, it could open up though. Travis Wittlake is the prize recruit of this class. The freshman/sophomore division at 174 was actually one of the tougher weights of the entire tournament, regardless of division. He won it comfortably, knocking off highly touted OU freshman Jaryn Curry in the semifinal, and getting a major over nationally ranked Chase Vincent of OCU in the final. Anthony Montalvo is right behind Wittlake as far as recruiting stars go. He’s definitely one that OSU fans should expect to be a key part of the roster in the future. Unfortunately, he lost to the eventual champ Heath Gray in the quarterfinal. He bounced back and won third, which is a good thing to see. A lot of top recruits aren’t used to losing and struggle with taking those hits and coming back. You really hope this lights a bit of a fire for him as he goes into the season. Overall, this is about what you’d expect for a tournament like this. A few minor slips, and a few revelations about how the lineup could shakeout. As a whole, it was not a bad showing to kick off the season.